Will unexpected inputs cause a runtime error? How much of my model/code have I really tested? Reactis Tester employs a patented technology called guided simulation to build test suites. The tool tracks an array of coverage metrics as it computes test data, and it uses uncovered targets of these metrics to influence the creation of subsequent tests. Coverage metrics include generic objectives such as Decision, Condition, and Modified Condition/Decision Coverage (MC/DC), Simulink-specific measures such as branch and subsystem, and Stateflow-specific metrics such as state, condition-action, and transition-action. Differences are automatically detected and flagged. Coverage metrics include Statement, Decision, Condition, and Modified Condition/Decision Coverage (MC/DC). As Reactis Tester generates tests, it performs an array of checks to flag runtime errors in your C code. Memory errors are particularly easy to make in C and can be very hard to debug. A memory error occurs whenever a program reads-from or writes-to an invalid address. Memory errors are particularly common in C programs because the C programming language gives the programmer direct access to the program's memory, which can boost performance but also allows software defects to access arbitrary memory locations. Some errors flagged by Reactis include out-of-bounds array indexes, buffer overruns, dangling heap pointers (accessing a region of heap-allocated memory after the memory has been freed), dangling stack pointers (accessing a pointer to a local variable of a function after the function has returned) and the use of pointers cast from incorrect numeric values. Reactis Tester not only detects these types of errors, it returns a test that can be executed in Reactis Simulator to pinpoint the underlying cause of the error. How do I understand, diagnose, and fix a bug? Execute a block, single step, or multiple steps at a time. To see data values, hover with the mouse, open a scope, or add to watched variables. Unexercised parts of model are highlighted in red. When using the Reactis for C Plugin or the Reactis for EML Plugin, its like having an advanced source code debugger right in your Simulink environment. 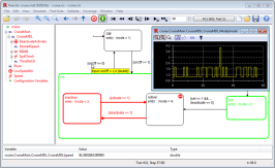 Debugging Simulink, Stateflow, Embedded MATLAB, and C code is all controlled from the same simple interface. Execute a single statement; step into, over, out of functions; execute a full step or multiple steps at a time. 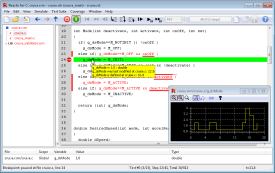 Unexercised parts of code are highlighted in red. Will the brake always deactivate the cruise control? Validator uses a test and check approach for verifying models or code. You first instrument your model/code with checks that monitor whether behavior is consistent with expectations. Validator then uses the test-generation component of Tester to create and run test data to see if any checks can be violated. These tests can then be used to diagnose the cause of any abnormal behavior detected. Validator gives a user two ways to define a check: as simple textual expressions similar to the assert capabilities found in programming languages, or as a Simulink / Stateflow model. In the latter case, the model implementing the checks is intended to monitor the behavior of the controller model and raise flags if any violations are discovered. Eliminating runtime errors is important, but only one step towards high-quality software. A program that does not crash, but does the wrong thing is also unacceptable. Reactis Validator gives you a way to formulate and perform checks that your program is operating properly. Checks are formulated in a way similar to the assert mechanism of C.